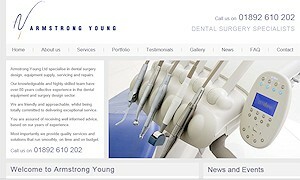 Armstrong Young are a dental surgery design company based in Crowborough. They already had a website, but after four years, it was in need of a makeover. Their previous site was a simple brochure site, but this time they were looking for a "magazine" look with news/blog functionality to keep the content looking fresh. It was decided to go for a clean grey/white look to showcase the beautiful dental surgery designs. A lot of time and effort went into creating user friendly content in a question/answer format. As with all sites, created by NWK Media, the site has been fully optimised for targetted keywords in google and the other search engines. A content management system has been added to allow staff at Armstrong Young to update and add fresh content to their website, as and when they like. A big thankyou is owed to Colleen and the rest of the team at Armstrong Young for their input, constructive feedback and attention to detail, to create a website, we are all very proud of.